putting up with me, Mozart, and his wife. At sixteen, my big sister Aloysia looked like the painted goddesses who reclined voluptuously above our heads on the ceiling of the opera house. Like them, she was blonde, rosy, round-breasted, and narrow-waisted. Although she didn’t fall in love with Mozart, as both he and my parents so ardently wished, I did. It happened because Papa staunchly maintained that no matter how tight things were, we could, “Always spare a little beer and some of Jo’s fine liver dumplings.” He was forever bringing home traveling musicians from the court, absolutely certain that one of these fellows would be useful. Mama never believed his hospitality would yield anything to our advantage, but this peccadillo was the only one my father owned. Some of our guests were famous, most were not. All, however, had exciting stories to tell about the great courts they’d seen and famous performers they’d heard. Besides, once they set eyes on Aloysia, they were glad to spend an evening giving impromptu lessons. The most notable wanderer Papa brought home was Wolfgang Mozart. He had stopped at the Mannheim court on his way to Paris. After composing a piece for one of our noblemen, Herr Mozart had required a copyist. He was naturally directed to my Papa, whose desperation was such that he took on every kind of odd job. Of course, Papa knew of him, this miracle of nature who’d been entertaining kings since his sixth year. With the copying job finished, Papa took his pay and invited the famous Herr Mozart to The Ox. After downing a stein of our justly famous beer, they would harmonize on a familiar tune—the treachery of the nobility. It quickly became apparent that our families had much in common. The story of Papa’s fall, without the questionable details with which Mama liked to embellish it, was central. Years ago, as a bailiff for Baron Schonau, Papa had provided handsomely for his growing family. His master, finding him compliant (what poor man with four daughters to dower is not?) involved him in a crooked business deal. When the deal went bad, Schonau had the perfect scapegoat. In the end, we had to flee the baron’s lands in the middle of the night to escape arrest. On horseback, Papa decoyed the pursuing politzei away, while Mama and the rest of us were driven across the border of the electorate in a farm wagon. Under the hay was hidden our klavier and a wardrobe; the latter stuffed with a random collection of whatever had come first to hand. Mozart listened to this story of betrayal and ruin with great sympathy. He hated his master, Archbishop Colloredo, as thoroughly as Papa hated Baron Schonau. Mozart explained that his father, an educated man and an able musician, was constantly humiliated and bullied by the archbishop. In fact, Wolfgang was in Mannheim because he had resigned his commission and was traveling through the world looking for another. Archbishop Colloredo was Mozart’s devil and Baron Schonau was Papa’s. They called for more beer and pondered the great question of the day: whether a talented, hardworking man could make his way in a world dominated by aristocratic privilege. Papa had sized up his companion well. Such an invitation, a combination of earthly and musical pleasure, proved absolutely irresistible. For days before the visit, Papa primed us. Herr Mozart was young, but he had already been commissioned to write operas for the most important Italian cities. To honor his guest, Papa found copies of two arias from Lucio Silla, an opera Mozart had written five or six years earlier, and set Aloysia to practice them. Unfortunately, for us, they were both bravura arias, written for a prima donna who loved to display not only the power of her voice, but a three-octave range. Aloysia was so diligent that our ears rang, and the neighbors kept coming around to complain. On the day, which was to prove so fateful for me, Josepha was excused from cooking and I from sewing; such was our division of labor. Fat Josepha cooked, beautiful Aloysia sang, and I, curly-headed, chubby Konstanze, sewed. Sophie, the baby, belonged to Mother, and waited only upon her. In those days, I imagined my task the most rewarding. For what happened to the fruit of my sisters’ long labor? The cook’s delicious dinner disappeared into someone’s gullet and the singer’s aria vanished into thin air. On the other hand, a nicely embroidered petticoat or shirt gives pleasure again and again. I’ve always had an impulse to practicality. As the third daughter, my life was full of hand-me-downs. How else to get clothes that fit? “Herr Mozart mustn’t see you doing servant’s work,” said Mama. “Oh, Mama,” I fretted.” Why do we always have to pretend we’re better off than we are?” That day I had been sewing a badly needed petticoat for myself. Her favorite word! Nevertheless, the afternoon would be easier to endure with busy hands. From beneath a pile of mending, I dug out a hoop of long neglected petit point. No sooner had I settled down with it than Herr Mozart, surprisingly diminutive and wearing a jacket stiff with the most exotic French needlework I’d ever seen, arrived at the door. I’ll confess my eye dwelt upon the lavishly ornamented jacket for a long time before I gave as much as a second look to the man inside. Slender, boyish, and short, Herr Mozart looked nowhere near his twenty-one years. To me, Papa’s “little mousekin” (or, in Jo’s nastier parlance, the runt) our visitor’s lack of size was rather intriguing. His eyes were the feature, however, which finally seized and held my attention. They were the largest, most luminous, sky-blue eyes I’d ever seen. They shone with alert good humor. I liked his hair, too—a curly blonde mop which had already begun an escape from his queue. As you’d expect in a klavier player, his hands were shapely and restless. He kept fidgeting with his tricorn, turning it ‘round and ‘round. Aloysia had on her best dress, a peach satin that perfectly complimented the bloom in her cheeks. Our maid, Marie, had spent an hour brushing Aloysia’s hair, drawing the chestnut strands over a cushion to give it extra height. Men had already drowned in my sister’s eyes, but she was far too good for any of them. Too good especially for the young musikers of the orchestra who continuously besieged her with flowers, painted ribbons, and necklaces. Broken hearts littered our small garden, the place where she disposed of all such importunate suitors. As Herr Mozart bent over Aloysia’s hand, I saw his blue eyes lift and fasten upon the bow ornamenting her bosom. At once, I knew that, world-famous wunderkind or not, he was going to be as big a fool as all the others. Aloysia always carried a fan during these parlor skirmishes. She snapped it open and fluttered it about as if it was a languid summer day instead of midwinter. The little gentleman wasn’t immune. Already his pale cheeks were coloring. Jo made a disgusted face, but Mama delivered a pinch to one of her fat arms. One by one, Papa presented us. For me, perfect posture was inevitable. My dress, one of Aloysia’s hand-me-downs, had been taken up, but during the altering, I hadn’t realized that the waist was too tight. By the time I did, it was far too late to do anything about it. To wedge me in, Mama had laced the stays so hard I couldn’t get a proper breath. Feeling a little faint, I bobbed a very straight curtsy and kept my chin up, all the time praying the seams of the dress would hold. As I rose, I met Herr Mozart’s bright eyes. Was he laughing at me? I remember blushing, my embarrassment about the dress—and myself—palpable. After some polite chat, Mozart took Aloysia’s hand and led her to the klavier. As soon as he saw his arias on the music stand, he gave my father a veritable sunburst of a smile. “Wandering children returned to their Papa!” He lifted the scores and gazed at them fondly. “Frau Wendling often sings these for our elector, but just wait until you hear my girl, Herr Mozart,” Papa said. After a little more about how pleased he was that his music had found its way back to Germany, Mozart sat and began the prelude, dropping into the music as effortlessly as a muskrat slides into water. There was none of the preliminary fussing I’d seen other pianists affect. Soon Aloysia’s coloratura was rising, fire to the heavens. The high notes floated effortlessly; the lows were likewise perfect, full, rich, and round. My sister’s voice wasn’t the only faultless music I heard that afternoon. As Herr Mozart’s handsome hands flew over the keys I was amazed, not only by his easy manner, but also by the beautiful sounds he produced from the strings of our weary, old klavier. Jo’s eyes became slits. Clearly, she wasn’t enjoying the show. The sad fact was that her voice was every bit as fine as Aloysia’s, but she was plain, overweight, and a very good cook. All of this had kept her worldly endeavors, thus far, confined to our kitchen. On that long ago afternoon, our father was ready to burst with pride. Even our unmusical Mama seemed genuinely interested, although perhaps it was only the richness of our guest’s jacket, and what that implied, that so intrigued her. Herr Mozart became a regular visitor. He was supposed to make his way to Paris if he couldn’t find a position in Mannheim, but he didn’t seem anxious to leave. Before meeting us, he’d spent most of his time with influential members of the orchestra, like Herr Wendling, whose wife and daughter were stars of the opera, or with Kapellmeister Cannabich. With innocent candor, Mozart told Papa that he preferred us. “Being with you dear people is just like being home,” he said. Of course, the attraction was Aloysia. 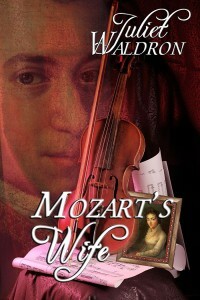 Unlike some of her other beaux, Herr Mozart seemed to admire her talent at least as much as her figure. After an hour of accompanying her, he rose from the klavier as flushed and joyous as if they’d spent the time kissing. Mozart gave my sister lessons upon that instrument, and she soon was accompanying her singing with far more skill. He swore to Papa that he would do everything he could to help her career. What’s more, he was as good as his word. Among other important people, he introduced her to Herr Raaff, a famous tenor now living at the Mannheim court. Raaff was past his prime, but he had many important friends. The vain, old tenor was charmed by Aloysia. Immediately he invited Papa, Mozart, and his bella Signorina Aloysia to a party where the guests were a heady mix of successful musicians and wealthy aficionados. Their evening proved a great triumph. In fact, the next night at the opera, a group of these same partygoers wildly applauded Aloysia’s one, small canzonetta. They even called for an encore. This incident was to mark the beginning of my sister’s meteoric rise as a singer, but the immediate effect was to put the reigning prima donna’s nose out of joint and make Aloysia insufferable for days. When Mozart presented himself at our door, my little sister, Sophie, and I would scamper to open it. We knew, you see, that Aloysia would make him wait. It was a torment she routinely inflicted on all her admirers. Sophie and I didn’t care how long she took. While Mozart waited for his goddess, we had him all to ourselves. He was always obliging; a delightful playmate who showed us cat’s cradles we’d never seen. He was also a dangerous and incredibly dexterous opponent in games of jacks. As soon as Aloysia appeared, however, the fun was over. By the time the little man straightened from bowing to the coquette posing in the doorway, lover’s anxiety had entirely extinguished his natural sparkle. I couldn’t endure being around them then, even though their music was beautiful. I hated the slave who now gazed from Wolfgang’s blue eyes. I hated the gushing Italian compliments he paid. I knew my sister. The more he doted, the more she would despise. Poor Wolfgang! His tics, and he had a fair number, intensified in the presence of his idol mio. His nervous fingers were the worst, often going completely out of control, either drumming on the tabletop or tying his watch chain into hopeless knots. Within a few weeks Aloysia could mimic him perfectly—his busy hands, his submissive bow, his florid Italian. Spiteful Jo was her most appreciative audience. Heaven knows, Mama and Papa, who had begun to dream about a match with the wunderkind from Salzburg, would not have been amused. “I think you’re both horrible,” I said, wanting to defend him, but this only sent Jo and Aloysia onto the sofa where they rolled about giggling in a most unladylike fashion. She then imitated our sleepy, young priest as he slurred the Latin of early Mass. Nevertheless, Jo and I both knew Aloysia would relentlessly lead on this newest admirer. It was her nature.